Your child's oral development generates considerable changes during their "growing up" years. There are a number of things you can do to help support their development—but also things you shouldn't. Here are 4 things not to do if you want your child to develop healthy teeth and gums. Neglect daily oral hygiene. To set the best long-term course for optimum oral health, begin cleaning the inside of your child's mouth even before they have teeth. Simply use a clean wet washcloth to wipe their gums after feeding to reduce bacterial growth. 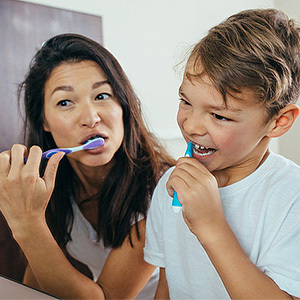 Once you begin seeing teeth, start brushing them every day with just a smear of toothpaste; at about age 2 you can increase that to a pea-sized amount. And don't forget to teach them when they're ready to brush and floss on their own! Allow unlimited sugar consumption. Besides the effect it has on overall health, sugar is also a prime food source for disease-causing oral bacteria. You can reduce the sugar available for bacterial growth by avoiding sugary snacks and limiting sweet foods to meal times. Less sugar means less bacterial growth—and a lower risk of tooth decay for your child. Put them to bed with a sugary liquid-filled bottle. Although a bedtime bottle may help calm your baby to sleep, it could also increase their risk of tooth decay. Allowing them to sip on sugar-filled liquids like juice, milk, formula or even breast milk encourages bacterial growth. Bacteria in turn produce acid, which can dissolve the minerals in enamel and open the door to tooth decay. Sipping through the night also deprives saliva of adequate time to neutralize acid. Wait on dental visits until they're older. Dental and pediatric associations all recommend first taking your child to the dentist sooner rather than later—by their first birthday. Starting dental visits early will help you stay ahead of any developing tooth decay or other oral problems. And just as important, your child will have an easier time "warming up" to the dental office environment at a younger age than if you wait. Dental visit anxiety, on the other hand, could continue into adulthood and interfere with regular dental care.